The 6 LED Bike Light by NEBO offers 90,000 MCD of bright white light. The Bike Light has 2 lighting modes: 100% On and Flash Mode. Three AAA batteries are included to provide 50 hours of continuous illumination. 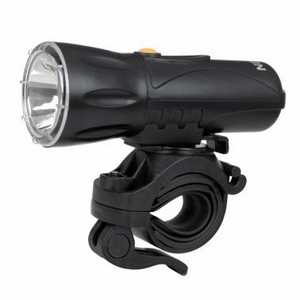 The Bike Light has a convenient quick-release mount to turn the Bike Light into a flashlight. A lanyard wrist strap is also included to keep this light handy. The bike mount rotates a full 360� to direct light wherever you need it. Constructed with impact plastic housing, this shock-proof, water-resistant Bike Light is an essential add-on to your bicycle. This Bike Light is easy to install, no tools required.